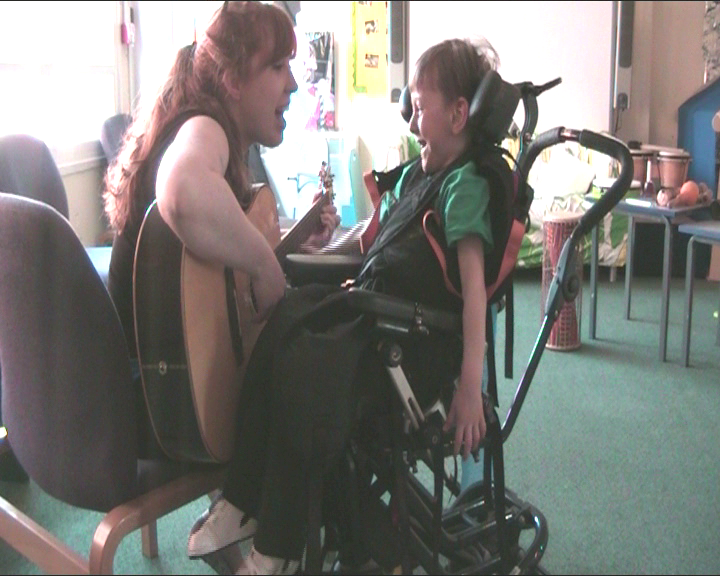 Music can touch absolutely everyone, and this means that music therapy can make a difference in all people’s lives. You do not need to have any diagnosis to benefit from a course of music therapy. Some people wish to explore themselves, meet new people or have a creative outlet for an issue that is currently impacting on their lives. MusAbility accept referrals from many sources including self-referrals (client or guardian), GP referrals, healthcare referrals (such as from an occupational therapist or speech and language therapist) and clinical referrals (such as from a hospital or homoeopath). This list is not exhaustive so please enquire if you wish to be referred from elsewhere. Although NHS referrals are accepted, music therapy is unfortunately not currently available on the NHS, though some clients use Direct Payments to fund sessions. It has been proven in many areas or healthcare, including music therapy, that the earlier the therapeutic input begins, the more successful it is likely to be. It is for this reason that we work with babies in the womb with women who are pregnant, through labour (music therapy, not just music listening, has been researched to reduce pain and maintain calm in both mother and baby), with new born babies and pre-school children. A baby in the womb is genetically programmed to respond to music, whether a disability or condition is present or not. Children have an innate musicality, and using music therapy with a child who has broad global developmental delay or a specific clear diagnosis enables the child to learn and develop using the musicality that they are literally born with. MusAbility work with babies and pre-school children to teach steady breathing and vocalising, reduce pain and discomfort, encourage communication, promote eye contact and sharing, and most importantly to support relationships within the family unit. We know that bringing a child into the world is a big step which adds pressure and strain to any family, and that having a child with a disability or condition can increase family pressure to breaking point. Music therapy can be the bridge that is needed, whether this is between extended family members, couples, parents and children or siblings together. It can be extremely difficult for people with mental health disorders to communicate their inner state at any given time…perhaps due to a lack of awareness between reality and psychosis, perhaps because the words to describe their current state simply do not exist. Music therapy can be used in mental health to explore difficult feelings and experiences without the intensity of spoken word, although this can certainly be an aspect of the work. One client may come for music therapy because they love a particular music artist and want to sing together…another may have a specific request, such as wishing to write a song for a family member to express their recent experience, the next may come to improvise and release their current anxiety or stress. Sessions can be 1:1 or in a group, dependent on individual needs. MusAbility work with patients both sectioned under the Mental Health Act 2007 in hospitals, and with those back in the community to support them towards goals for expression, communication and development. The modern roots of music therapy are in autism and learning disabilities, and music therapy in this area is widely researched and promoted. Work with people with learning disabilities is varied – mainly because ‘learning disability’ is such a broad topic, with some clients having high functioning autism and perhaps needing support to build confidence and self-esteem or make choices more easily, and others with profound and multiple learning disabilities who may have no physical ability let alone an ability to meaningfully express themselves. 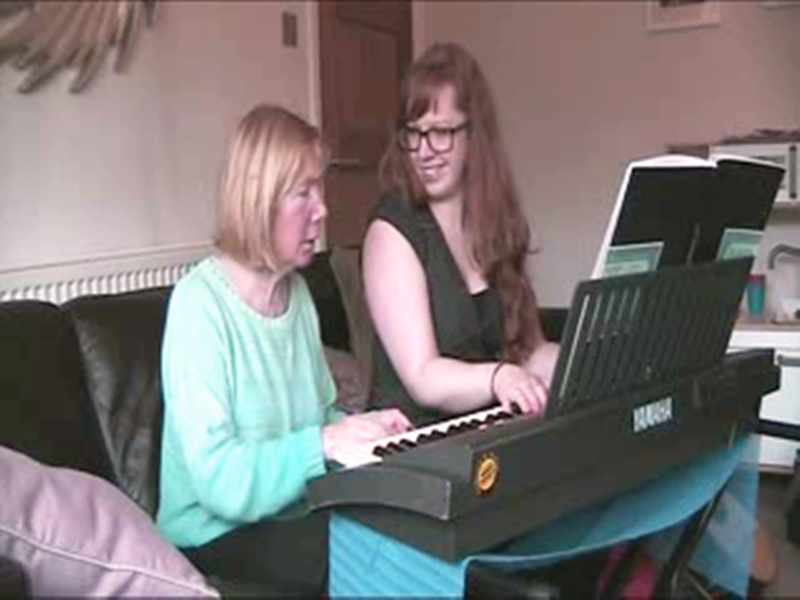 Music therapy can provide all people with learning disabilities that platform to gain awareness of themselves and others, with goals being client specific and client led, but which may include learning to use the voice to support breathing and communication, enhancing relationships between families, peers and staff, reducing pain and promoting health and wellbeing. MusAbility work with people with learning disabilities at all levels and all stages of their lives, from birth (including family therapy and support), through schools, into day centres, adult services and jobs right into end of life care. Hospice and Palliative care is really the epitome of how music therapy can benefit an individual, mainly because it addresses ALL four domains of palliative care: physical, emotional, social and spiritual. Music therapy calms and creates peace, provides a platform for expression, creates memories for family members and reduces pain. To a music therapist, every breath is musical, rhythmic and an expression of the individual that we are working with, and with this breath, an entire piece of music can be created. As a music therapist, supporting a person through the end of their life is incredibly humbling and special, whether working with a child or an adult, and the improvements in that person’s quality of life are evident. Music therapy has been clinically proven to reduce the amount of sedative and pain medication required. It supports the individual psychologically, improves mood and reduces stress and challenging behaviour. MusAbility work with and support children and adults in end of life care and their families, in both hospice settings and at home. Music an aspect of every school curriculum, but music education is not the same as music therapy. 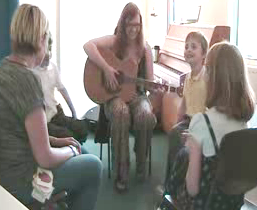 Music therapists work in both mainstream and special schools with a wide variety of children. In mainstream school, a music therapist may engage with a nurture group or on a 1:1 basis to assist children who need extra emotional, physical and social support, or to manage challenging behaviours due to psychological upset, whether this is long-standing or temporary. In special schools, a music therapist can be a core member of the support staff, to enable children to express themselves, reach goals and communicate. 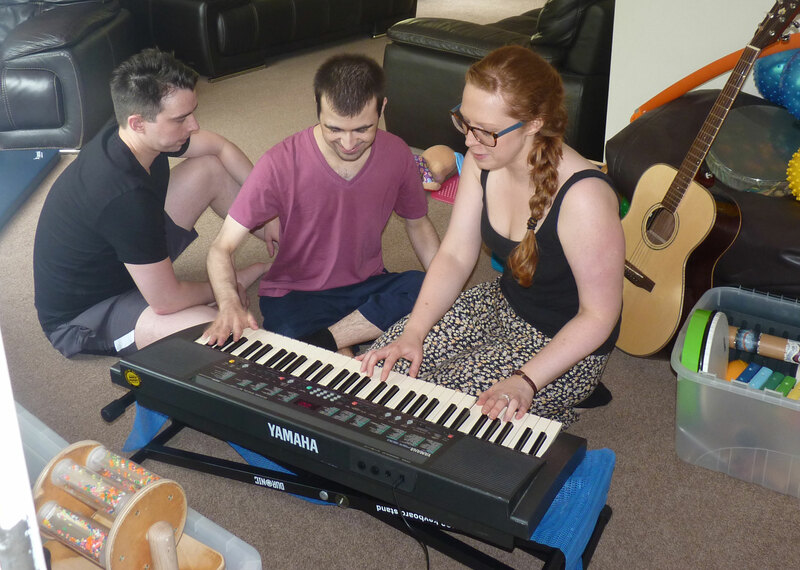 Although music education in special schools certainly focuses on individual needs, music therapy is centred on every aspect of how the child is acting and reacting at any point in time, which means that no two sessions are ever the same. A music therapist is trained to be aware of and respond to the most minor of reactions and to empower the individual to develop this. In what can be a highly stimulating and busy environment, music therapy can provide the supported space for a child to simply exist and express themselves, or an engaging and intensive session to promote focus. MusAbility works with children in mainstream and special education, on a 1:1 or group basis at school or at home. Family support can often be an aspect of our work, and we strive to support the family and school unit as a whole. When an individual has early onset or acute dementia, the world can become a frightening and confusing place full of unfamiliar people and places. For many people, music can be the only anchoring factor which provides a sense of security and memory. It is common knowledge that music listening brings people together and reduces isolation… but playing a CD or listening to a performance is not music therapy. Whether with a group or an individual, a music therapist working with adults with dementia continually assesses the people in the room. It is their role to enable expression for those who are struggling to engage, provide grounding and inclusion for those wandering and unable to sit, and offer a safe, creative outlet for frustration, anger and aggression. Music therapy has been clinically proven to reduce agitation in older adults with dementia, leading to the reduced uses of analgesics and sedatives. 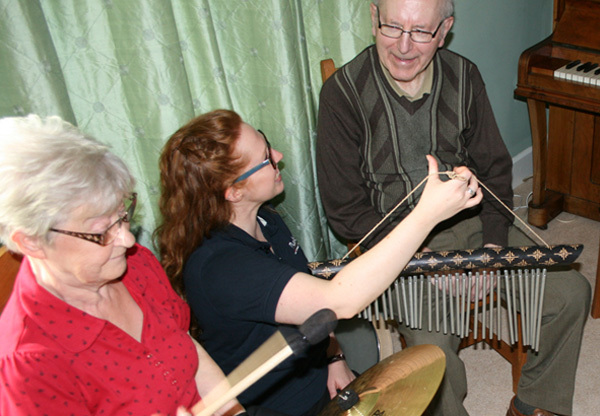 Family are important in dementia care, and music therapy can provide sessions which not only engage all family members in a structured activity, but which also provide relaxation and often a glimpse of a past life of sharing and laughing, which can feel truly valuable to all involved. MusAbility work with older adults with dementia in care home and own home settings. The benefits of music are clear, but nothing compared to the presence of a trained music therapist understanding, listening, supporting and empowering. Music is processed in multiple parts of the brain, meaning that if one area stops functioning, ‘bridges’ can be built with other areas using music. 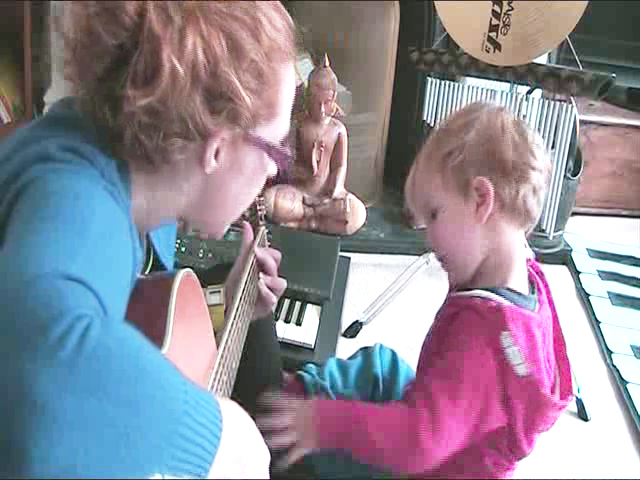 A music therapist uses music in several specific areas: to compensate for lost skills and increase memory and communication, to enable emotional expression - from accepting and adjusting to a neurological condition to expressing difficult emotions and often re-join society, and to physically regain function through neurological training. For those who have suffered an acquired brain injury or a stroke, music is much easier to understand and relate to than what can appear as a jumble of words. For many with Parkinson’s Disease, music therapy increases well-being, reduces stress and pain, improves movement and breathing, improves memory and provides a means of expression and communication. MusAbility works with people of all ages with both acquired and traumatic brain injury, Parkinson’s Disease, Epilepsy, Multiple Sclerosis, Muscular Dystrophy and Rett Syndrome…to name but a few. Music therapy is similar to counselling and psychotherapy in that it is based around a secure therapeutic relationship with a professional. Where counsellors rely on words, music therapy does not have that restriction. Many private clients that we work with wish to explore their lives through a less intense means, whether this is because they are struggling with issues too distressing to talk about, or simply because they need deeper support than they feel that a classic counsellor may be able to give. We do not only work with people who have diagnoses, disabilities and impairments, but the general public too. Each and every one of us has been drawn to music at some point in our lives to help us through difficulty, relate to another person or express ourselves, and this process is made easier and more meaningfully with a music therapist. While talking can be helpful for some, for others it causes distraction and is something to hide behind, making music therapy a more simple way to access, process and release challenging thoughts and emotions. MusAbility works with private clients of all ages in their own homes, or at a mutually agreed community location. Our music therapists are both more highly qualified and more specialised than counsellors, but we know how powerful music can be, so we also charge less than the average one.